This is why you always ink the side of the ramps. As the Splatfest rages on into the night, InkTV is hosting one of the first tournaments for Splatoon 2, the G7 Splatoon Series. In today’s match between Nosebreathers and Nsquared Squid Squad, one player made quite an impressive Rainmaker run. 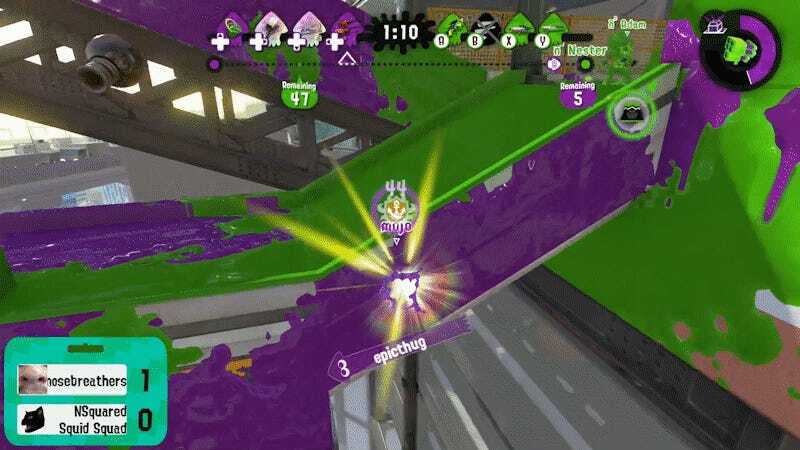 If you haven’t jumped into ranked yet to play Rainmaker, it’s a little like capture-the-flag, only the flag is a golden ink-bazooka. The goal is to get the Rainmaker to your enemy’s pedestal, and while most other players were occupied, Nosebreathers’ Mojo grabbed the Rainmaker and set off for the top. Usually you would have to push up the ramps on Moray Towers to get there. Rather than make that arduous journey, Mojo used the ink rails and then swam up the side of the ramps, just out of view of the other team. Once they got there, one shot from the Rainmaker and a jump up the side got them on the pedestal before anyone could splat them. The G7 Series resumes tomorrow with more teams fighting it out for the first major win in Splatoon 2. You can tune in to watch on InkTV’s Twitch channel.